When exporting your storyboard, you can set the export behaviour for each layer. This can be handy if you have reference layers that you do not necessarily want to see in your final export. You can set individual layer export settings in the Layers panel. In the top-left corner of an existing view, click on the Add View button and select Layers. From the Thumbnails or Timeline view, select the panel containing the layer for which you want to change export options. In the Layers view, select the layer for which you want to change export options. If you want the layer to be included when exporting your project as a Portable Document File (.pdf), unchechk PDF. Otherwise, uncheck it. If you want the layer to be included when exporting your project as movie files or image sequences, check Movie. Otherwise, uncheck it. 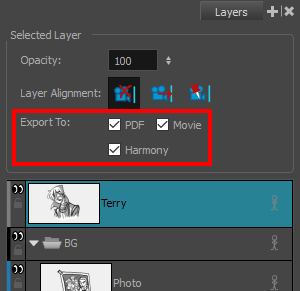 If you want the layer to be included when exporting your project as Harmony scenes, check Harmony. Otherwise, uncheck it.